When people talk about why they come to Aiken, they always mention the footing. It's sandy, so it is easy on hooves. It never freezes, so you can ride all year round. 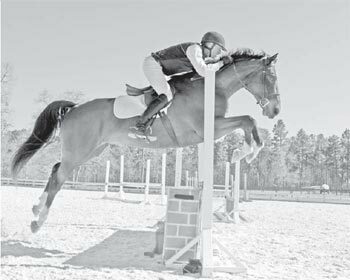 Aiken's natural soil is ideal if you want to foxhunt or go for a trail ride. But if you are riding and competing seriously, you are going to need an arena. And if you are riding in an arena every day, you will discover that you need to do something to keep your footing useable. Aiken's natural sand gets ground up into a fine powder if you ride over the same spots every day. If it is dry, you will have dust; if it is wet, there will be mud. Aiken's got good footing, but if you want great footing, you are going to need to bring in some footing. "We did a lot of research on different kinds of footing for our arena," says Jenna Weiner, who, along with her family, owns Bridlewood Farm in Aiken. Jenna trains and competes in the hunter/jumper ring. "In the end, it came down to two different types, and we chose GGT footing, because we thought it was the best, especially for jumping." 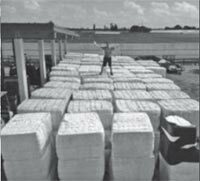 GGT Footing textile arrives in large bales. John Abbott, who is Bridlewood's trainer, says that riding in a GGT arena was what sold him the product. "I went to Florida and rode in a GGT arena at the Winter Equestrian Festival," he says. "That convinced me that it was the best product. The nice thing about it is that the horses love it. It's like if you put the best pair of running shoes on that you could possibly wear. You can tell the horses are comfortable on it. It's never heavy, and it's never slick. It's also very clean and it has great traction." Jenna explains that a lot went into making the arena. First, they put down a level base and created efficient drainage. Then, they installed the footing. GGT stands for German Geo Textile, and GGT is the equestrian division of the American textile company, Polysols. The footing itself is made of remnant first-cut polyester material, which is then mixed with sand. GGT provides three basic types of material. First there is "Geo" which looks like felt flakes, then there is polyester fiber, which looks like 1-2 inch long threads. Geo is the basic ingredient for riding arenas, while many high end arenas used for dressage and jumping have a custom recipe of Geo with fiber. One custom blend includes a third type of elastic fiber made from lycra fiber to give the surface more spring. There is also a new colored blend that cuts down on the glare if the arena is located in a sunny spot. Whatever the blend, the textile comes in large square bales, and can be delivered directly to the arena or to a sand quarry for blending. "We were lucky because the quarry where we got our sand in Columbia was able to mix the GGT footing in right there," says Jenna. "Then, when they brought the footing to us, it was already completely mixed and perfectly consistent. Today, if you look down in the arena, the footing is exactly the same everywhere you look." Cynthia Brewster Keating, who is the national account manager for GGT, lives in Aiken and swears by the product. She explains that one of the main benefits of GGT is that the textile fibers retain water. A good irrigation system is also necessary as it to keep the sand from becoming dusty, giving the footing a firm resiliency that is a good shock absorber, but that never feels deep. The GGT arena at Black Forest Equestrian, home of Shawna Harding Dressage. "The best way to describe it is to think of walking on the beach," says Cynthia. "If you are up away from the water, the sand is dry and deep and hard to walk in. When you go down near the water's edge, especially at low tide, the sand is wet, but it is firm and it supports your weight. You don’t sink into it, and it feels good to walk on. That's what GGT footing does for your arena." GGT has been making arena footing for about 20 years in Europe but only expanded to the United States in 2008. They now have a factory in Spartanburg, S.C. and installations at many of the top horse show and private training facilities in the United States. In addition to WEF, there is also GGT footing at Dressage at Devon, Princeton Showjumping, the Hampton Classic, the Sacramento Horse Show, the World Dressage Masters, White Fences Equestrian, the Upperville Horse and Pony Show . . . the list goes on. 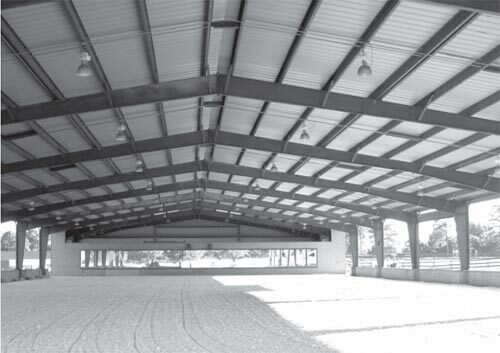 Bridlewood is the most recently installed GGT arena in Aiken, but it is not the only one. For instance, there is another GGT arena at Black Forest Equestrian Center where the dressage rider Shawna Harding teaches and trains, and Daniel Geitner stables has a GGT arena. GGT footing has a lot of positive buzz in the horse world, and demand for the product was up more than 25% over last year. It tends to be its own best salesman. "People ride on it at a show and they really like it," says Cynthia. "Then they want the same arena at home." The company also offers specialty groomers for arenas that keep the footing firm underneath and fluffy on top, and they sell arena additives that can keep down dust and reduce the need to water the arena as frequently. One of the latest innovations is the new Butterfly Mat, which can be installed between the base and the footing. These mats make it possible to have a thinner base and to use less footing while also providing skid resistance and shock absorption. Made from recycled material, they include drainage holes for times when there is too much water, as well as water cups, to retain moisture when there is not enough. The mats can even be installed over concrete, making it possible to convert an indoor warehouse into an indoor arena, for instance. Put down the mats, cover them with a GGT and sand mixture, and you’re ready to go. Planning and building a professional-quality arena is not a small undertaking, and there is a lot to learn about what makes a good riding surface. With so many years of making equestrian footing behind it, GGT has developed a number of different ways to create and maintain an arena that can be custom-tailored to any discipline, from show jumping to dressage to Western. Those who ride for pleasure might also consider adding some textile to their riding areas – they might not need a professional surface, but a little textile can go a long way. "It makes the arena softer," says Cynthia with a laugh. "If I'm going to fall off, I'd rather do it onto GGT footing than onto the ground, I can tell you that!" "I absolutely recommend it," says John Abbott. "If you can afford to do it, do it. For a facility like ours, it is definitely worth the investment. I ride six to eight horses a day and I have clients in there all day, so it gets a lot of use. The horses go so well on it. After riding on it, I can also tell that my horses are going to stay sounder longer because it gives them such a good cushion and it's just very comfortable. That right there makes it worth it. I really love it, and we're so fortunate to have it."